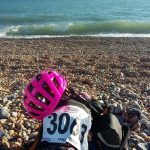 Taking part in a London to Brighton bike ride had been on my endurance ‘bucket list’ for a long time – I was only waiting for a perfect moment! Doing it in June was out of the question; Ramadan would have just finished by then and the weather was too hot for my condition. Waiting until September 16th actually paid off, with temperatures of 22 degrees and lovely head wind and sunny spells it was a perfect set up for an adventure. 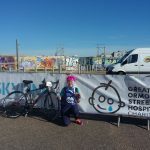 To make my dream beneficial to others, I decided to raise money for Great Ormond Street Hospital (aka GOSH) in London, who look after seriously ill children. motive8 are always excited to get involved in sports challenges and fundraising, especially when it comes to health and children’s matters, so I was delighted motive8 could contribute to my fundraising for GOSH. When registering for the race, there is an option for bus transportation back to London, which is limited. I booked early, as for an extra £30 you can save yourself from a headache of planning your own return. They also wrap your bike prior to transport to avoid any damage. Being on the bus gives you a lovely opportunity to chat to fellow participants in a relaxed mode and to share your experience, too. Race numbers with a time tracker, a bike transfer wristband and a beautiful quality GOSH jersey (yes, a proper jersey with a zip and back pockets!) arrived in the post well prior to the race, so the excitement was building up. Other preparations included: checking up my LIV Avail SL1 Disc bike, investing in a good gel seat and decent padded leggings, charging bike lights and packing a bladder backpack with hydration tablets, energy bars and some first aid supplies. If you are planning to race for time (as you will receive your official time post-ride online), then training for the ride is a must. 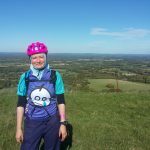 Due to my ever-changing schedule (I am a Locum spa operative) and my metabolic condition (hypothyroidism), my goal was to simply complete the route, enjoy the weather and scenery and soak in the event’s atmosphere. Therefore, my only training was a 9-mile warm-up at the Queen Elizabeth Olympic park road track on Thursday. The starting point was at Clapham Common (the nearest tube station being Clapham South), and with the ride day falling on Sunday and my home being in Walthamstow – with no overground service before 9am – it only meant one thing. Cycling 14 miles from home to the start line. Organisers were very generous with the start window, 6:30am – 9am, so after a failed attempt to get my bike (even without wheels) on the Tube, I had enough time to get to the start line by bike. Clapham base was well organised: registration points, coffee hut, water bottle refill station, mechanics tent and porta-loos were all well-spaced. There were dozens of different teams riding for various charities; a total of around 4000 participants on the day! When I finally got it to the start base, I saw a group of riders wearing GOSH jerseys too. So I decided to say hello and see if I could tag along. It was a 15-strong group of GTK employees (electronic cable manufactures). They were very friendly and even got me to pose for their group’s pre-start pictures! There was no rush, so we departed just before 9am and crossed the finish line at a comfortable 16-16:30. Another bit of exciting news: if you are not aiming to compete for the time, you can ride ANY bicycle you are comfortable with! There were dozens of MTB, Brompton bikes (Yes! And some of them rode all the way up Ditching Beacon mile), a BMX bike, hybrids, and really cool tandem bikes. Also, all the abilities are welcome – there was an assisted blind rider too. My favourite event characters were tandem teams and riders with music. One of the riders had a helmet with flickering lights on front and back, and played the best cycling tunes you can get: love it or hate it, but classics like “What a Feeling” and “Another One Bites the Dust” were real hits and kept us going. The route was well outlined with arrow signs on every turn and junction and marshals supervising difficult sections and major roundabouts. 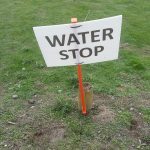 Water and rest stops were placed along the route at 10 miles and 17 miles, at the buffet lunch point at 30 miles and at the top of the famous Ditching Beacon at 45-mile points, with the team of mobile mechanics and medics at hand to look after us. There were also square mile signs, so it provided a build-up of sense of achievement as the day progressed. The route is 54 miles in total. But for me, it would cross the 70 mile mark by the time I got home. There were several long and wriggly downhill stretches, and while vast majority did well, I came across unlucky riders twice – luckily for them though, medics were quick to respond. My fingers kept going numb, so I took my bike to the mechanics on the lunch stop to see what they could do to help. After the angle of the handlebars tilt was changed, my hands felt better, giving me confidence to continue. Buffet lunch was already cold, but that did not stop hungry riders piling up their plates with pasta and rice dishes, brie cheese, boiled eggs and a choice of dressings. A variety of hot drinks was also available, ensuring lacto-free and caffeine-free were available for all. It came in handy to refill the coffee thermos flask I was carrying on my bike. The lunch break atmosphere was so relaxed that some riders even took a little nap before continuing the ride! GTK team spread themselves along the route, so it was great to catch up with them every now and then – we were all cheering each other up, especially when it came to Ditching Beacon. I will mention a ‘secret’: the majority of the riders actually walk their bikes all the way up. Yes, as did I as I had not trained for the event. But do not be fooled, as walking it up seemed just as challenging. At the top we were rewarded with the stunning countryside views, a water break and lots of wind to cool us down. Riding into Brighton, we had to stick to the cycling lane while on an A road, and then the city route became busy with local traffic. Once onto the promenade, riding carefully, yet overtaking some tired riders, I really wanted to cross the finish line in speed and style! Madeira Drive was busy and full of sunshine. Official photographers were taking pictures past Ditching Beacon and on the finish line – who could resist a wave and a cheeky grin into the camera? As soon as the finish line is crossed, we were rewarded with an official event medal, a bottle of water and lots of cheers from the organisers’ crew, fellow riders and the general public. What. A. Feeling! Then it was just a little walk back to queue for transportation. The transport was delayed, so we had some time to head to the beach and enjoy the sea breeze and waves until the bus arrived. The journey back was very chatty and relaxed (although my arms really started to ache) and we got back fairly quickly. Once off the bus, riders surrounded the truck that was carrying the bikes. “3063!” shouts the organisers’ crew – and I am off to Clapham Junction Overground station. I am trying not to fall asleep on the train, tightly holding my bike and my medal in my hands. Stratford! And another 2.9 miles of cycling. My legs finally feel the pain of the day. As soon as I got home, I was eager to count all the miles I pedalled in one day – 71?! I enjoyed every moment of it, and would definitely do it again. MTB, next year? 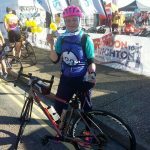 Thanks to motive8 for the donations – it kept me going! The rides are organised every year and there are several dates to choose from. On some dates you can opt either for the on-road or off-road route. 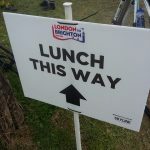 The websites (I used https://www.londonbrightoncycle.co.uk/) provides you with all the information you need to start preparing yourself for the ride, and a list of charities you could fundraise for – although you can do your own. Organisers were very prompt to reply to emails and easy to reach by phone during the event. I would definitely recommend allocating some training days towards the ride, it will make it easier on uphill sections and you can later boast that you actually cycled up the Ditching Beacon. If you don’t have padded shorts or a gel seat, or both, that includes gloves too – I recommend investing in those before you start training. You can get used to them and if they are not a good fit, find better ones before it is too late. Sun cream is a must: unless it is pouring with rain, in windy conditions the tan develops even if the sun is not always out. Bottle holders – I had two – one for clean water, another one for coffee flask (little coffee shots really gave me the boost when I struggled on uphill sections). Having a water bladder backpack is a great option too – it usually comes with pockets, so you can store extra bits there also. And most importantly: service your bike regularly, wear helmet and enjoy the ride!